Within 2-3 days, we will know the results of Miss Earth 2015. Like every year, the pageant has had number of contests prior to the finals and the results of the contest help the experts in getting a feel about the front-runners. Of course, the medals don’t affect final placements, but the results of important events like swimsuit & evening gown competitions are helpful in making predictions. Miss Earth 2015 Hotpicks were relatively easier to come up with compared to other pageants for the same reason. This year Miss Earth has some clear front-runners and we are pretty sure one of the main winners will be from that group. 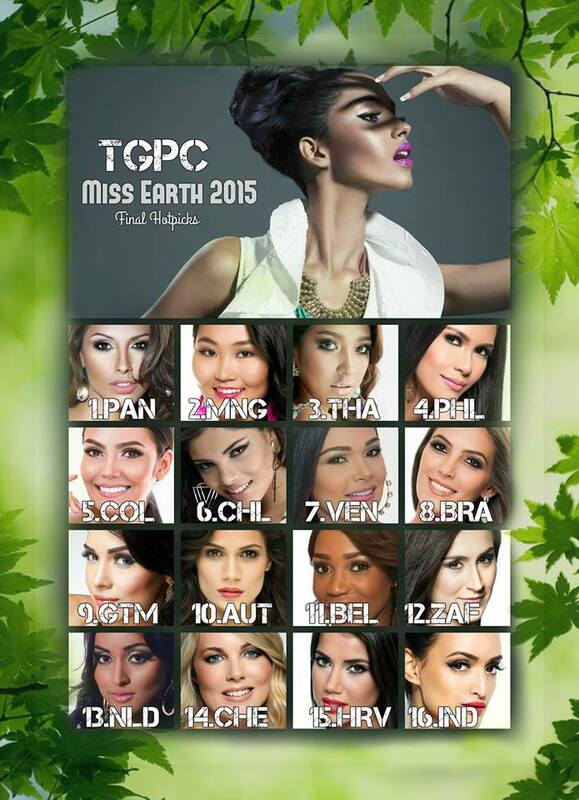 Mongolia and Panama are clear front-runners for Miss Earth 2015 title. Panama has clearly performed the best in the pageant by far by winning 3 Golds. Mongolia can pull off a Riyo Mori type of victory in the pageant with her surprisingly strong performance by far. Thailand lived upto the expectations from her by her strong performance. Philippines tend to send their best in this pageant and Angelia Ong is no exception. Colombia won the swimsuit competition and has been considered to be one of the prettiest girls in the pageant. Chile is a pre-pageant favorite and lived upto the hype especially in evening gown and cocktail wear competitions. Venezuela has always done well in the pageant and this year’s beauty is no exception. Brazil is a powerhouse in Miss Earth and Thiessa proved her mettle in the swimsuit competition. Guatemala is a surprise this year and she has done exceptionally well; she can even win the pageant without surprising anyone. Austria is the home-delegate and frankly can be the leader of the weak European contingent this year. Belgium is a gorgeous black-beauty – perhaps the best black delegate of the year. South Africa has done well in the pageant by far and will perhaps represent Africa in the finals. Netherlands is one of the best faces of Europe. Switzerland and Croatia are other European beauties who can win the nods from judges. India has a chance to place simply because apart from Philippines, Mongolia and Thailand, Asia is pretty weak! Sri Lanka, Ecuador, Congo DR are close-shots. Thus, few countries are clearly dominating the race for the Miss Earth title. We can confidently say that the crown will be worn by one of the Top 9 beauties in our list! Let us hope the best one wins. Manasvi Mamgai: Another Miss India in Big Boss House?